The nonlinear relationship between inorganic aerosol precursor emissions and aerosol concentrations makes designing optimal emissions controls far from straightforward. For helpful receptor-oriented sensitivity analysis, ANISORROPIA (the AdjoiNt of ISORROPIA, an aerosol thermodynamic model) has been developed. Independently, ANISORROPIA determines the sensitivity of fine mode aerosol concentrations to inorganic aerosol precursor concentrations. In the adjoint of a chemical transport model, it can answer a plethora of questions related to emissions, their origin and relative sensitivities of aerosol to precursors. Implementation in the GEOS-Chem adjoint and the adjoint of CMAQ is ongoing. 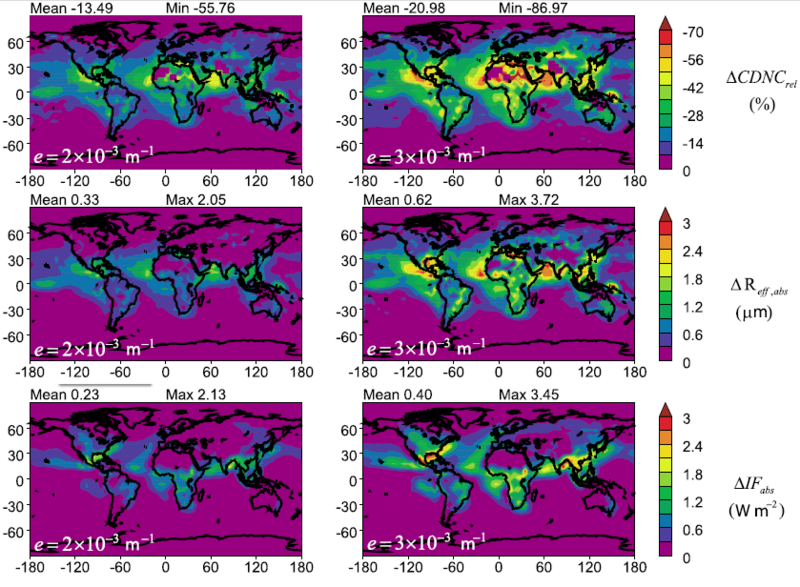 In these global and regional modeling frameworks, inverse modeling with large sets of observations from satellites and ground-based measurements promises to refine emissions estimates of inorganic aerosol precursors such as ammonia and nitrogen oxides. This study presents the sensitivity of global ice crystal number concentration, Nc, to the parameterization of heterogeneous ice nuclei (IN). Simulations are carried out with the NASA Global Modeling Initiative chemical and transport model coupled to an analytical ice microphysics parameterization. Heterogeneous freezing is described using nucleation spectra derived from theoretical considerations and empirical data for dust, black carbon, ammonium sulfate, and glassy aerosol as IN precursors. When competition between homogeneous and heterogeneous freezing is considered, global mean Nc vary by up to a factor of twenty depending on the heterogeneous freezing spectrum used. IN effects on Nc strongly depend on dust and black carbon concentrations and are strongest under conditions of weak updraft and high temperature. Regardless of the heterogeneous spectrum used, dust is an important contributor of IN over large regions of the Northern Hemisphere. Black carbon however exhibits appreciable effects on Nc when the freezing fraction is greater than 1%. Compared to in situ observations, Nc is overpredicted at temperatures below 205 K, even if a fraction of liquid aerosol is allowed to act as glassy IN. Assuming that cirrus formation is forced by weak updraft addressed this overprediction but promoted heterogeneous freezing effects to the point where homogeneous freezing is inhibited for IN concentrations as low as 1 L−1. Chemistry and dynamics must be considered to explain cirrus characteristics at low temperature. Only cloud formation scenarios where competition between homogeneous and heterogeneous freezing is the dominant feature would result in maximum supersaturation levels consistent with observations. This study presents a global assessment of the sensitivity of droplet number to diabatic activation (i.e., including effects from entrainment of dry air) and its first‐order tendency on indirect forcing and autoconversion. 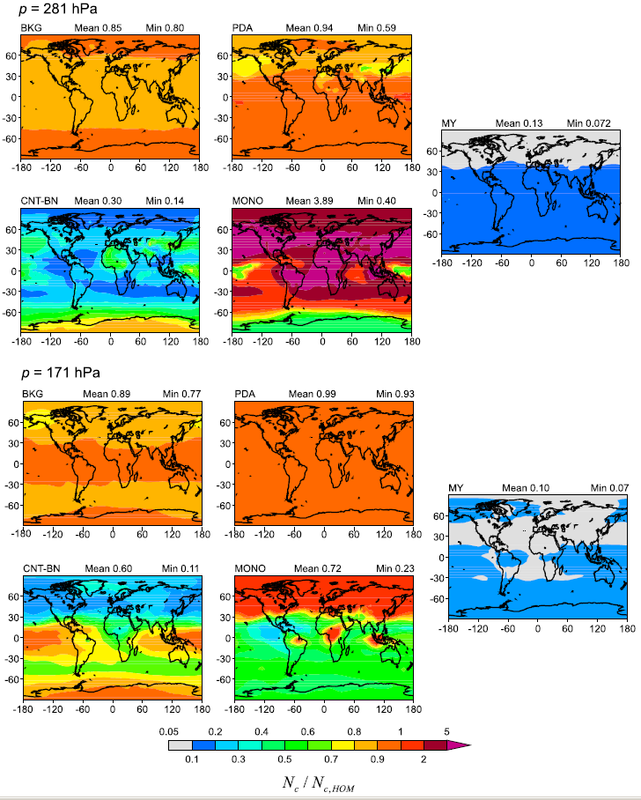 Simulations were carried out with the NASA Global Modeling Initiative (GMI) atmospheric and transport model using climatological metereorological fields derived from the former NASA Data Assimilation Office (DAO), the NASA Finite volume GCM (FVGCM) and the Goddard Institute for Space Studies version II’ (GISS) GCM. Cloud droplet number concentration (CDNC) is calculated using a physically based prognostic parameterization that explicitly includes entrainment effects on droplet formation. Diabatic activation results in lower CDNC, compared to adiabatic treatment of the process. The largest decrease in CDNC (by up to 75%) was found in the tropics and in zones of moderate CCN concentration. This leads to a global mean effective radius increase between 0.2–0.5 micron (up to 3.5 microns over the tropics), a global mean autoconversion rate increase by a factor of 1.1 to 1.7 (up to a factor of 4 in the tropics), and a 0.2–0.4 W/m2 decrease in indirect forcing. The spatial patterns of entrainment effects on droplet activation tend to reduce biases in effective radius (particularly in the tropics) when compared to satellite retrievals. Considering the diabatic nature of ambient clouds, entrainment effects on CDNC need to be considered in GCM studies of the aerosol indirect effect. 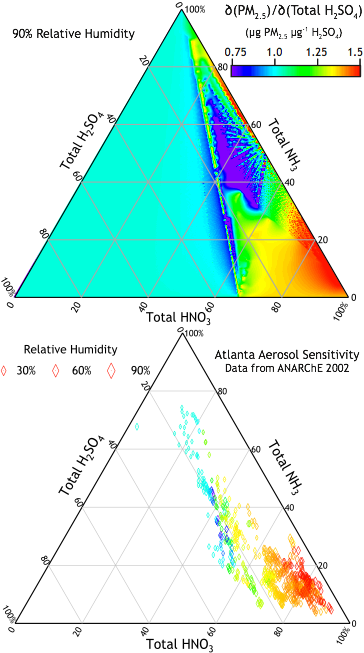 Aerosol-cloud interaction studies to date consider aerosol with a substantial fraction of soluble material as the sole source of Cloud Condensation Nuclei (CCN). Emerging evidence however suggest that certain types of insoluble aerosol (e.g. mineral dust) act as good CCN even if they lack soluble material, because of water vapor adsorption onto the surface of the particle. Based on this evidence we have made efforts to estimate for the first time the potential contribution of insoluble dust on cloud droplet number concentration (CDNC). 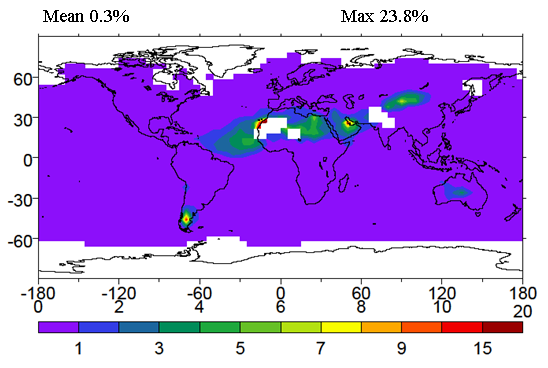 Simulations are carried out with the NASA Global Modeling Initiative Chemical Transport Model using an online aerosol simulation (that considers fossil fuel, biomass burning, marine, and dust aerosols) and cloud droplet number concentration (CDNC) calculation that explicitly considers the competition of soluble and insoluble CCN for water vapor. The predicted annual average contribution of insoluble mineral dust to CDNC is up to 23.8% in cloud-forming areas of high dust concentrations (shown in the figure). Sensitivity tests suggest that uncertainties in dust size distribution and the water adsorption parameters can modulate the contribution of mineral dust to CDNC by 23% and 56% respectively. Coating of dust by hygroscopic secondary materials during its ageing would enhance dust contribution to CDNC; however, even freshly emitted dust can have significant regional impacts on cloud formation.